Culinary school didn’t teach me how to bake. OK, that’s not really true. My Baking class taught me how to bake . . . in a restaurant. Of course, the purpose of culinary school isn’t to teach you to be a home cook, or a food blogger. It’s to teach you how to cook in a restaurant, so that’s exactly what they did. We used a live sourdough starter for all of the baguettes and bread loaves we made, and we had a (too nice) instructor who made sure to tell us when the dough was proofed enough, and when it should come out of the oven. Thus, very little of the skills I learned in that class translated to just baking a loaf of bread at home for my husband and I. One of my New Year’s Resolutions for 2014 was to improve my yeast baking skills. Nine months later, I’m learning how to raise my first-ever yeast bread baby. 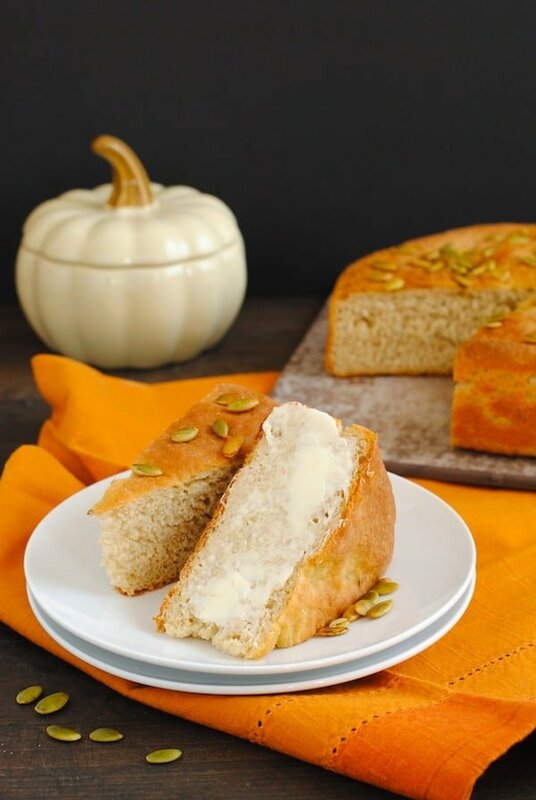 I decided to start with a basic beer bread, but use pumpkin beer as the beer to be all seasonal and such. And honestly? It wasn’t nearly as hard as I was expecting. If I can do this, anybody can, trust me. Here’s how it went down. The most important step of any recipe is the first step: gather your ingredients. Be all French about it and say you’re gathering you’re mise en place. Realize that you only need half the pumpkin beer for the bread, so you can drink the other half. Toast yourself that you’ve completed the first step. 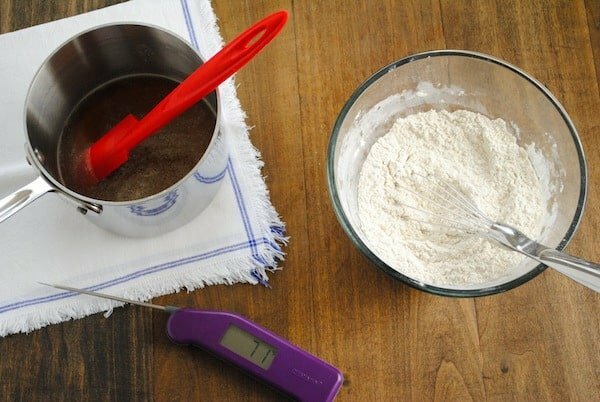 Stir together some all-purpose flour and rye flour in a bowl. In a small saucepan, warm beer, water, honey and butter until the mixture is between 100 and 110 degrees F. Use your (preferably purple) kitchen thermometer to verify. 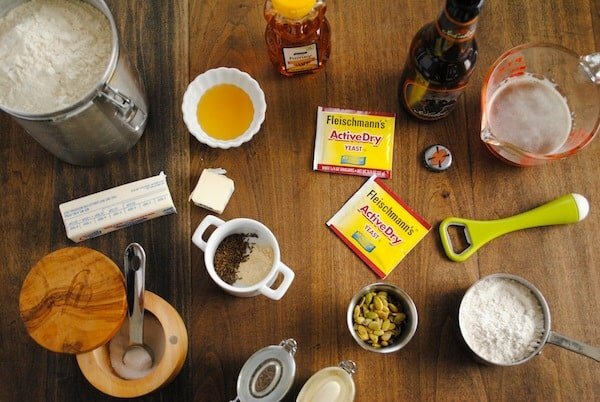 Whisk together warm beer mixture, some of the flour mixture, 2 envelopes Fleischmann’s® Active Dry Yeast, salt, caraway seed and garlic powder until smooth. 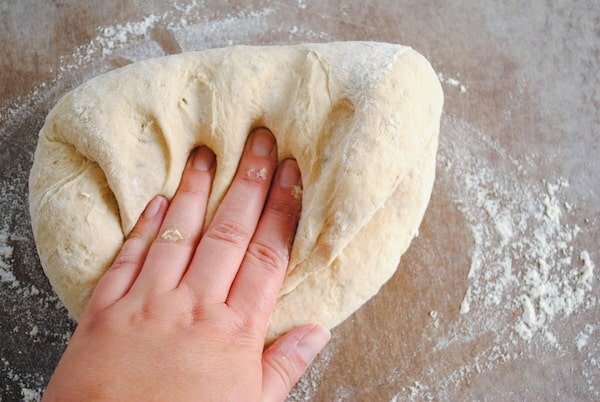 Stir in additional flour until a soft dough forms. And I knead you now tonight. And I knead you more than ever. Softly sing a bread-making-themed version of “Total Eclipse of the Heart” to yourself while you knead the dough for about 5 minutes or until it’s nice and smooth. Shape the dough into a ball and press it into a greased baking pan. Cover it, put it in a warm place and go watch some bad TV while it rises for about 45 minutes. When you return, it will have magically doubled in size. Do a little dance, because so far, you are doing it right. 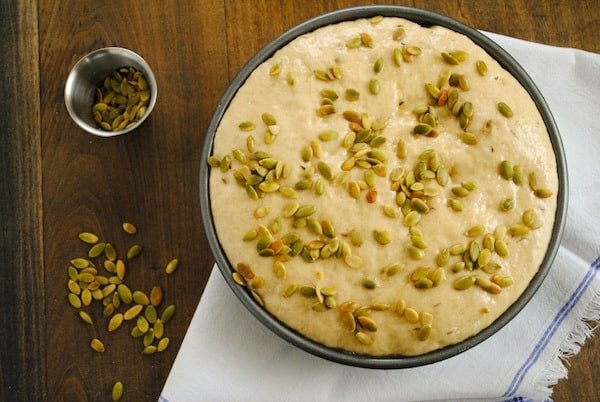 Brush the dough with a little bit of melted butter and sprinkle it with pepitas (roasted pumpkin seeds), if you want. Bake in a 375 degree F oven for 25 to 30 minutes or until the bread is baked through. Remove it from the pan and let it cool a little bit on a rack. But serve it warm and slather it with butter. Because warm bread + slathered butter is really what baking is all about. To tell you the truth, this bread was even better than my favorite brewery’s beer bread. Even if most of the pepitas fell off the top when I sliced it (oh well). Not too shabby for meeting my new year’s resolution, right? While I had so much fun baking this bread last week, I know that not every family is as lucky as mine. All across America, families are struggling with hunger and children are often hit the hardest. That’s why Fleischmann’s® Yeast is launching the Baking A Difference campaign to benefit Share Our Strength’s No Kid Hungry® campaign. If you like to mix up treats in the kitchen, then we challenge you to bake for someone you love and bake a difference. Consider hosting a bake sale to spread the word! Inspire family, friends, teachers, neighbors and others to get involved in the campaign. Collectively, we can all harness the power of baking recipes and bake a difference together to end child hunger in America. For more information, visit http://www.breadworld.com/NoKidHungry.aspx. In medium bowl, stir together 1-1/2 cups of all-purpose flour and rye flour. In small saucepan, heat beer, water, honey and butter over medium-low heat until warm (100 to 110 degrees F). In large bowl, whisk together warm beer mixture, yeast, salt, caraway, garlic powder and 1-1/2 cups of flour mixture until smooth. 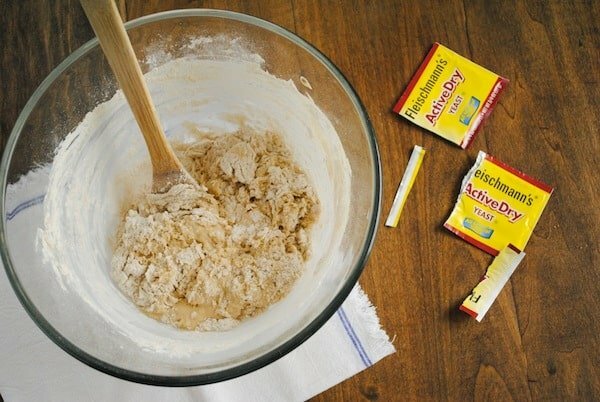 With wooden spoon, stir in remaining flour mixture and enough additional all-purpose flour to make a soft dough. Knead on a lightly floured surface 4 to 6 minutes or until smooth. Shape dough into ball; place in greased 8-inch round pan, turning to grease top. 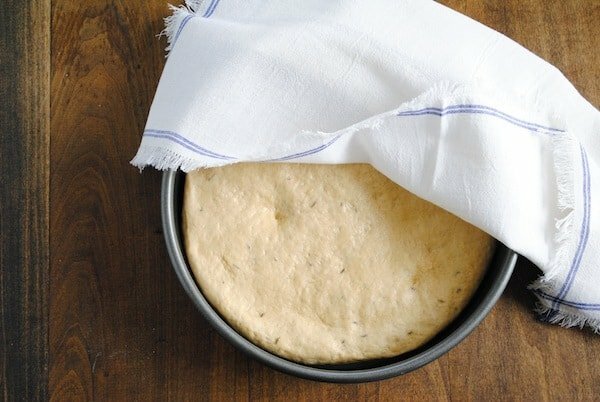 Flatten dough to fit pan. Cover; let rise in a warm, draft-free place about 45 minutes or until doubled in size. Meanwhile, preheat oven to 375 degrees F.
Brush dough with melted butter and sprinkle with pepitas; lightly press pepitas into dough. Bake 25 to 30 minutes or until fully baked through. Remove from pan; transfer to wire rack. Let cool 10 minutes before serving warm, or cool completely. Haha yeah, no actual pumpkin was harmed in the making of this bread. I just don’t think I’m ready for *actual* pumpkin yet, considering it was still almost 80 degrees today. Let’s just ease ourselves in . . .
OMG pumpkin and beer— say no more! 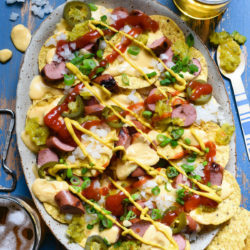 This sounds amazing and like something i’d make on a chilly wintery Saturday (which isn’t that far off for us Winnipeggers!). BTW, i totes adore your blog. Awww, thanks so much, Anna! I have a blogging friend in Calgary that got quite a bit of snow today, so it’s definitely not far off! 3) This looks SOO GOOD!! 1.) My world is so purple it’s ridiculous. 2.) Yes, let’s make that Priority #1 when we see each other next. Turn around . . . This bread sounds great. I’m curious which pumpkin ale you used. The only one I’ve had that I really love -that tastes just like good pumpkin pie -doesn’t come in bottles. Hi Susan! I used New Holland Brewing Ichabod Pumpkin Ale. New Holland is here in Michigan, and I’ve actually visited the brewery (and the restaurant there) several times. To be honest, I’m not a huge fan of pumpkin beers as far as drinking them (I ended up just having a few sips, but it wasn’t really my thing). However, my husband loves pumpkin beers, and this is one of his favorites. I just asked him about this one, and he says he likes it because it has the spices of pumpkin pie with a hint of pumpkin flavor, but it doesn’t overpower the flavor of the beer. Another good pumpkin ale is Southern Tier Pumpking Ale . . . If you can find it in a large bottle – usually only the Imperial vintage – you should buy it! I promise it will be worth the purchase. 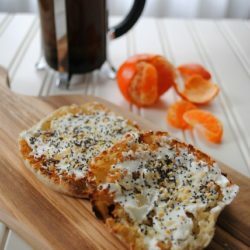 Lori, this bread looks fantastic and so perfect for fall!! Nope, I haven’t done any pumpkin baking yet either. And I swore off pumpkin spice lattes a few years ago because I finally realized that they taste like crap (no offence if you love PSLs!). 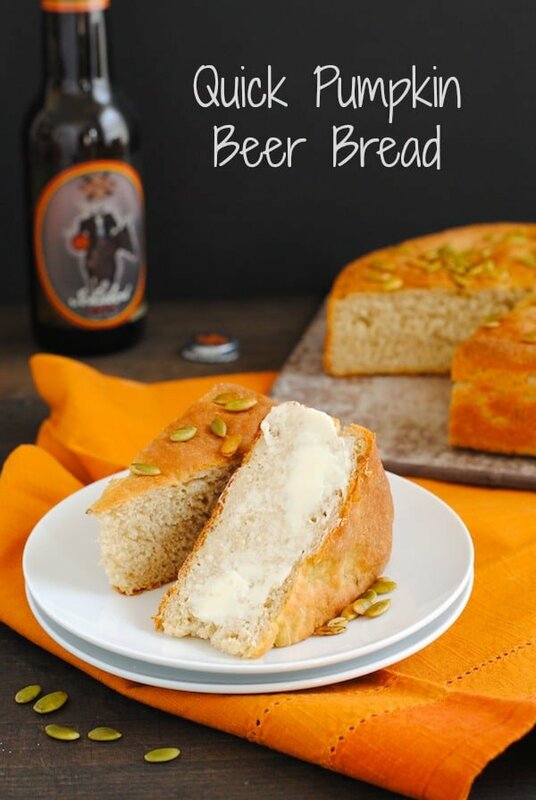 Using pumpkin beer in a bread I can totally get behind. Hopefully I’ll be FORCED to buy an entire six pack and will use just a bit for baking and the rest for toasting. Beautiful photos, Lori! Hey . . . I like PSLs . .. For about three weeks. Then the spices become a little overboard and I lose interest. Same with pumpkin beers – most just fall flat after you have had one six-pack. But, I guess that is why they are seasonal. 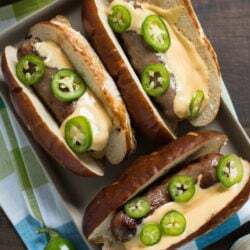 This recipe just SCREAMS FALL. It would never have occurred to me to use pumpkin beer. What a terrific idea!